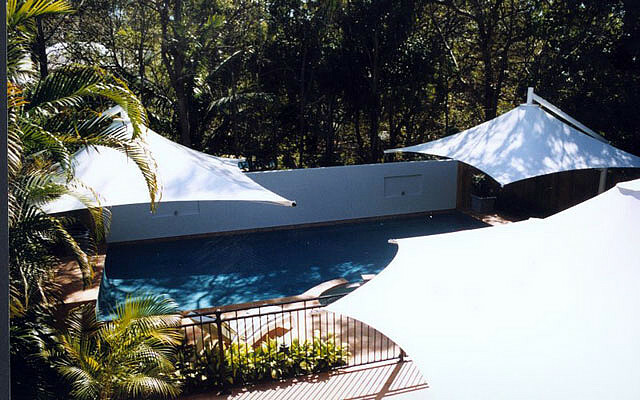 Others use offset patio umbrellas to shade their chaise lounge, their outdoor spa or a sunny section of the pool. Unless you are buying one that uses Sunbrella outdoor fabric, stay away from red or rust colors. They seem to fade the quickest. You can find this outdoor patio accessory in the spring at stores like Bed, Bath and Beyond, Tuesday Morning and Home Depot. The most popular one from Amazon is this 10' umbrella that costs around $160. The included bad requires four 30# pavers for a total of 120#. This 11' round offset umbrella comes with a plastic base that you fill with sand. A strong steel frame offers durability and stability. It also has a tilt feature and 360 degree rotation. An extra bonus includes 24 LED solar lights that come on automatically at night when your umbrella is exposed to several hours of sunshine. The fade resistant olefin fabric is also mildew resistant. If you like a mocha color this is a great umbrella for shade. This round 10' offset umbrella has a sturdy 2" metal powder coated pole with 8 heavy duty ribs. 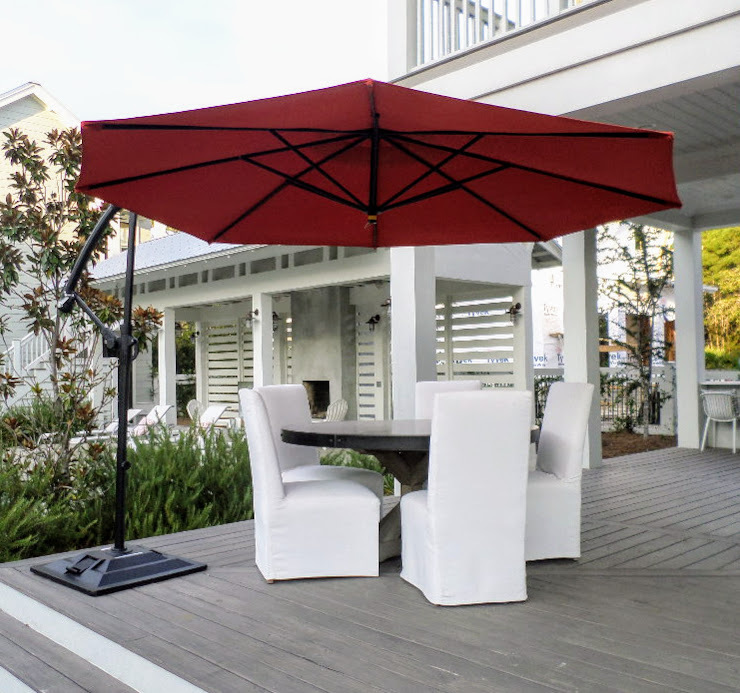 Use this offset umbrella to shade conversation areas, patio dining tables or even a section of the pool. Weights/base are not included and need to be purchased separately. Because it's so heavy you will need to buy heavy duty pavers/squares to weigh it down. Protect your umbrella with a UV treated cover made of WeatherMax material. Tested to withstand temps from 240 Fahrenheit to -100, this cover will not crack, fade, or deteriorate due to high or low temps or rain. This one way breathable fabric allows moisture to leave, but rain and dust to stay out. A snug fit with super strong fabric makes for a great cover for all weather conditions. Measuring 106 inches long and 20 inches wide it is large enough to go over the cantilever part of the umbrella. The rod running down the entire length of the cover makes it stiffer and the heavy duty zipper adds to the durability. Offset patio umbrella bases sometimes use paver stones or stepping stones that your purchase from your local home improvement store. Some cantilevered umbrellas are sold as a patio umbrella and base set. These bases are filled with sand to provide the weight that is needed. Other stands are specific to a model and make of an offset umbrella. Be certain where you want to position your umbrella because once you fill the base plates with sand, there is no moving it. If you are looking for a way to shade an outdoor seating area, so that you can find a spot to relax or enjoy a conversation with friends this style outdoor umbrella is the one for you.